Knobby, tannish-brown sunchokes may look like pieces of ginger root, but take one taste and you’ll know there’s no relation between the two. 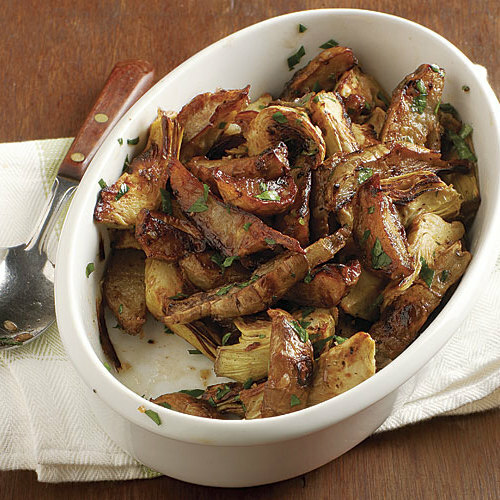 The sunchoke’s intriguing, subtly sweet, nutty flavor is more reminiscent of potato and jícama, with a hint of artichoke. Sunchokes can be scrubbed, sliced, and eaten raw as a crisp addition to salads and crudité platters, or used as a substitute for water chestnuts or jícama. They can also be roasted, steamed, boiled, or fried and served as a hearty side dish for cooked meats, poultry, and fish. 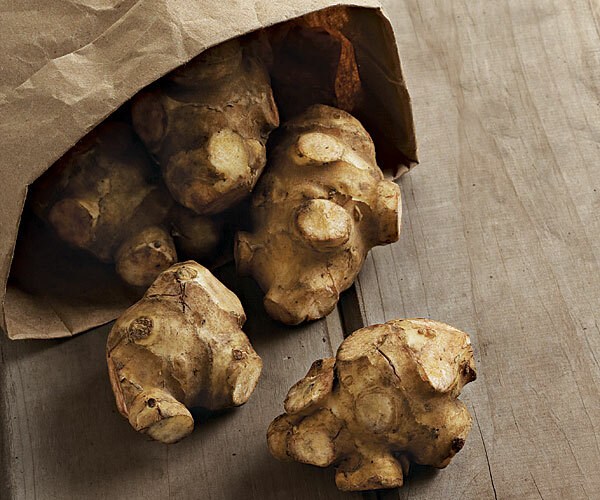 In season from fall through spring, sunchokes should be easy to find in stores right now. If you don’t see them, ask the produce manager to order some. You’ll both be glad you did. Though they’re also known as Jerusalem artichokes, sunchokes (Helianthus tuberosus) aren’t artichokes at all. They’re actually the tubers of a variety of sunflower, which is why sunchoke or sunflower choke is a better name for them. A good source of vitamin C, iron, thiamin, phosphorus, and potassium, sunchokes were originally cultivated by Native Americans. Choose firm, smooth-skinned sunchokes without sprouts or bruises. Avoid those that feel soft, wrinkled, or moist. Peeling sunchokes is optional. The thin peel has a slightly chewy texture, but it’s not unpleasant, and you may find the effort of peeling their knobby surfaces isn’t worth the return. The cut surfaces of sunchokes, like those of potatoes, tend to oxidize and turn pink. To prevent this, submerge cut sunchokes in lemon water until ready to cook. Sunchokes become tender and slightly starchy when cooked. To roast them, try the recipe at right, or cut them into chunks, toss with a little oil, season, and add to a roasting pan with a whole chicken or a pork or beef roast during the last half hour of cooking. You can steam or boil whole sunchokes until tender and then mash them roughly or serve them whole. For a creamy soup (the one instance where you may want to peel sunchokes so the soup has a smooth texture), simmer cut-up sunchokes in broth and milk or cream until tender and then purée. And to make addictive sunchoke chips, fry thin slices in peanut oil. Wrap sunchokes in paper towels and store them in a plastic bag in the refrigerator vegetable drawer for up to a week.